Please ensure you have your booking confirmation voucher/ and or booking reference with when you travel. 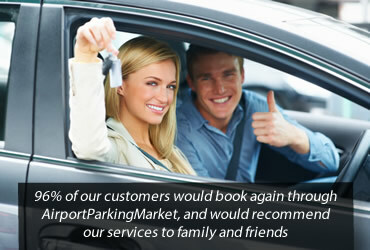 This will identify you as a AirportParkingMarket.com customer and enable the service provider to verify your booking. Where you have booked a car park that requires you to use credit card entry and exit procedures please ensure you have with you the credit card with which you booked. At AirportParkingMarket.com, we pride ourselves on offering the lowest and best available prices for secure car parking at all UK airports. On a daily basis we compare the prices on offer from over 200 airport car parks to find our customers the best available deals. We back up that statement with our price check promise. If you think you have found the same parking product for less, we need to know, so please get in touch, but remember that the product you are comparing has to be the same in all respects! In the unlikely event that you do find the same Airport Parking product for less within 24hours of making a booking with us, tell us and we will match the price or refund the difference. We will also give you a 10% discount on your next booking (*subject to the following terms and conditions). The following exclusions apply to price comparisons that will be considered as part of any claim made under the Price Check Promise. PLEASE NOTE: In making your booking you have agreed to be bound by the Terms and Conditions of Bookings for AirportParkingMarket.com. All of the car park services offered by AirportParkingMarket.com are based off-site, unless otherwise stated. AirportParkingMarket.com will not be held responsible for any claims for refunds based on any customer's claims that this information is not readily available on the site, as it is stated throughout the site and within the stated terms and conditions. 1.1 AirportParkingMarket.com is an agent for the featured car parks. You will be contracting with the individual car park and will be subject to their Terms and Conditions which may contain exemption clauses and limit each company's liability. Full details of these are available from the individual car park. 1.2 The car parks will accept liability for proven acts of their negligence. Claims cannot be considered once your vehicle has left the site (Park & Ride) or terminal (Chauffer and Meet & Greet) so please check your vehicle carefully before leaving. 1.3 AirportParkingMarket.com cannot accept liability in any circumstances where performance of the contract is prevented by reason of war, threat of war, riots, civil strife, terrorist activities, industrial disputes, natural and nuclear disaster, fire or adverse weather conditions etc. • Park and Ride Services: Please make sure you have directions to your car park, your booking ref., the car park telephone number, and details of the entry and exit procedures for the car park. This is all available on your booking voucher. It is your responsibility to obtain valid directions before departing for the car park -- any missed bookings, flights or other problems arising from the customer's failure to obtain valid directions will not be recompensed by AirportParkingMarket.com or any of our affiliates. • Chauffeur / Meet and Greet Services: Please make sure you have the chauffeur's telephone number, and details of arrival procedure as stated on your booking voucher. It is your responsibility to obtain this information before departing for the airport - any missed bookings, flights or other problems arising from the customer's failure to obtain this information will not be recompensed by AirportParkingMarket.com or any of our affiliates. 2.3 Procedures: If you are charged by the car park because you do not follow the correct entry or exit procedures or present your voucher, AirportParkingMarket.com may not be able to obtain refunds on your behalf. 2.4 Chauffeur Bookings: Any input errors resulting in company drivers being kept waiting or late arrivals by clients may result in a £10 administration charge, payable to the driver immediately. Please check the MORE INFO of the product for surcharges. 2.5 Moving and Relocation of Vehicles: You must ensure that, before leaving the vehicle with the car parking company that it is in a roadworthy condition, taxed (visibly displayed) and holds a current MOT if applicable. The car parking company reserves the right to move the vehicle within or outside the car parks by driving or otherwise to such extent as the car parking company, or its servants may in their discretion think necessary for the efficient arrangement of its parking facilities at the car parks, or in emergencies or to avoid accidents or obstructions. Ignition keys to the vehicle must therefore be left with the vehicle at the time of handing it over to the driver. It will be necessary in the exercise of the rights conferred upon the car parking company under this condition, for the car parking companies chauffeur to have the right to drive or otherwise take the vehicle on the public highway. The car parking companies chauffeurs are fully insured by the company for this purpose. 3.1 Price Changes: AirportParkingMarket.com are committed to providing the highest standards and the best choice of product, at the best prices, so throughout the season we continually review our products and prices. There are likely to be some seasonal special offers and in some circumstances prices may go up. 3.4 Surcharges: Please check the products MORE INFO for any additional surcharges. These charges are charged by the chauffeur/car parking company independently and bare no relevance to AirportParkingMarket.com or our advertised prices. 3.5 Two way 24-hour transfers from the car park to the airport: Included in the AirportParkingMarket.com price. 3.7 High-sided or unusually wide vehicles: Not all car parks can accommodate them or there may be an extra charge. Please check MORE INFO on the product or contact our office for details before making a booking. As a booking agent AirportParkingMarket.com advertises for numerous companies at any one airport, and as such advertise the best possible price for any given stay throughout the year for that airport. 5.1 ALL CANCELLATIONS MUST BE MADE DIRECTLY THROUGH AirportParkingMarket.com IN ORDER TO BE VALID. (Not with the car park). 5.2 You can send an e-mail to office@airportparkingmarket.com or Phone our SUPPLIER : 0845 4599 250 (Office hours only - Monday - Friday 09. to 17.00) quoting your booking reference number. Please note that cancellation requests can only be actioned within office hours and are subject to our notice periods (see 5.5). 5.3 Any clients booking where they have not complied with on screen booking requirements (e.g. printed off their voucher etc.) and who have been unable to park, will not be subject to a refund. 5.4 No refunds are available for unused part stays. • Edinburgh ParkanFly - Park & Ride/Meet & Greet - Less than 14 days - no refund. b) Cancellation Insurance does not apply for bookings made the same day, booked for the following day or in certain products where stated. Clients who take advantage of this service and receive their confirmation by mobile, in addition to their printed voucher, MUST ensure that their mobile is compatible with this service. The service itself is non-refundable. To amend your booking please use the contact us form or contact our office within office hours those fees will be paid to our SUPPLIER. The total liability for AirportParkingMarket.com to the client for all claims arising from the use of this website and materials is limited to the cost of the client's booking including both parking and booking fees paid to AirportParkingMarket.com as per the contract. Regulation 6 (b) of the distance selling regulations 2000 state that contracts for the provision of transport and leisure services while the supplier provides services on a specific date or within a specific period are exempt to the traditional 'cooling off' period placed on select online goods and services. Cancellations are subject to the contractual terms agreed upon within these Terms & Conditions. AirportParkingMarket.com may at any time modify these Terms and Conditions and your continued use of this website including telephone bookings will be conditioned upon the Terms and Conditions in force at the time of your use. If you have any further query over a booking you have made call 0845 4599 250 or Fax 01253 307658 ( Quoting Booking reference and name of the website ). This does not affect your statutory rights as a consumer. AirportParkingMarket.com has and is looking to join forces with other holiday related companies to offer clients more when they travel. Clients will be able to purchase items and services provided by these third parties via our website. Please note that AirportParkingMarket.com purely acts as a host for these products and any issues relating to those external products/services are subject to the providers own terms and conditions. Our web site may contain hyperlinks to websites operated by third parties. AirportParkingMarket.com does not control such websites and will not be responsible for their content or for any breach of contract or any intentional or negligent action on the part of such third parties, which results in any loss, damage, delay or injury to you or your companions. AirportParkingMarket.com is not responsible for the accuracy of opinions expressed in such websites, and such websites are not investigated, monitored or checked for accuracy or completeness by AirportParkingMarket.com. Inclusion of any linked website on our site does not imply or constitute approval or endorsement of the linked website by AirportParkingMarket.com. If you decide to leave our web site to access these third party sites, you do so at your own risk. All rules, policies (including privacy policies) and operating procedures of websites operated by third parties will apply to you while on such sites. AirportParkingMarket.com is not responsible for information provided by you to third parties.